Earlier this month, OPPO introduced two R-series devices in India dubbed OPPO R17 and OPPO R17 Pro (review). 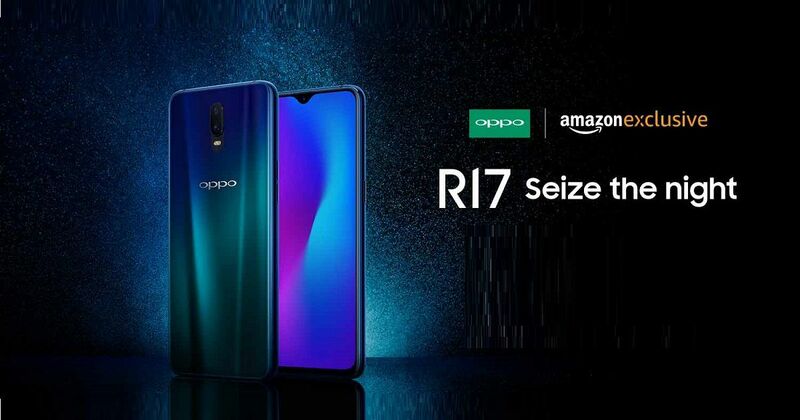 The latter went for sale with a price tag of Rs 45,990 soon after the launch, while the OPPO R17’s availability was not revealed. The company has now gone ahead and announced that the OPPO R17 will go for sale in India from December 24th exclusively on Amazon. The handset’s listing is live on the e-commerce site with a price tag of Rs 34,990. It comes in two gradient shades Ambient Blue and Neon Purple. OPPO has also revealed few offers that can be availed with the handset. Upon purchasing the OPPO R17 smartphone, Jio is offering up to 3.2TB data (on recharge of Rs 299) and benefits up to Rs 4,900. Buyers will also get One-Time screen replacement benefit, extra Rs 5,000 off on exchange, and no Cost EMI option. To recall on the specifications of the OPPO R17, the handset ships with a 6.4-inch AMOLED display with FullHD+ resolution, and an in-display fingerprint sensor. The screen sports a small ‘waterdrop’-style notch up top for selfie camera, latest Corning Gorilla Glass 6 protection, and a screen-to-body ratio of 91.5 percent. The handset has Qualcomm Snapdragon 670 chipset ticking at its core, accompanied by 8GB of RAM and 128GB internal storage. A 3,500mAh battery with Super VOOC fast charging support fuels the device. The tech is said to add two hours of juice in just five minutes, which is something its elder sibling – the OPPO R17 Pro – also claimed. In the camera department, the OPPO R17 features a dual 16-megapixel (f/1.7) + 5-megapixel (f/2.4) sensors on the rear with LED flash. As for the selfie camera, it sports a 25-megapixel shooter on the front with a f/2.0 aperture lens. Other features include dual SIM slots, 4G LTE, WiFi, Bluetooth, USB Type-C port, and 3.5mm headphone jack.